Did you know besides coming to school events, you can also help us raise money in small ways? Barron PTA participates in Amazon Smile, Box Tops Education collections, and Shoparoo. Next time you shop on Amazon, your shopping will make a difference. 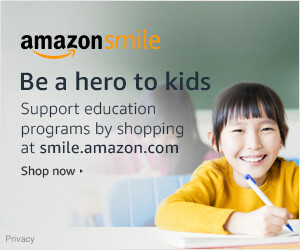 Do your regular Amazon shopping at smile.amazon.com and Amazon donates to Barron PTA. Before you throw away the trash make sure to check your boxes for the Box Tops symbol. Empty cereal boxes, among other products can help us earn nearly $1,000 a year for our school. Here is a complete list of products that have the Box Tops cut out on them. Box Top Product List. Did you know you can help the school earn money just by taking pictures of your receipts? It’s true!!! Shoparoo is an app that you download to your phone, from there all you have to do is Shop, Snap and Earn, it’s that easy. Every day receipts from grocery, convenient, and pharmacy stores, as well as some retail (Target, Five Below, Sephora, etc) count towards points. At the end of the year these points will be tallied and a school will receive a check from Shoparoo. Last year, our school raised close to $200 with about 15 parents participating, just imagine what we could raise if we had more participants! You can download the Shoparoo app depending on the phone you have by clicking on the links below. Follow the instructions once downloaded and you are on your way to helping our school fundraise!